2014 Kumpan 1954s. Picture credits - Kumpan. Submit more pictures. 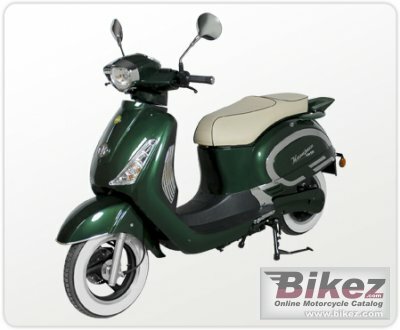 The model �1954� of �Kumpan electric� is the felicitous result of the combination of modern technique with elegant �design of former summer days. Thanks to the retro design aroused by its chunky eye and well-formed hips the �1954� appears very compact, but gains simultaneously in calmness and elegance. Color options: Racing green, cream, black, chocolate, white, deep red. Comments: Range: 50 - 60 km. 6 � 7 hours charging time. 48V, 38 Ah battery. German brand. Ask questions Join the 14 Kumpan 1954s discussion group or the general Kumpan discussion group.